MANILA, Philippines - The entire Metro Manila will be participating in a synchronized Metro-wide earthquake drill on Thursday, July 30 at 10:30 in the morning. According to Memorandum Circular 79, as signed by Executive Secretary Paquito Ochoa, all members of government departments, bureaus and offices are encouraged to participate in the drill. The private sector, including volunteer and civic organizations, is also encouraged to participate in and assist with the drill. The official website for "Metro Manila ShakeDrill" says this activity will increase the metro’s chances of better recovery and implementation of contingencies in the event of earthquakes. Studies showed a 7.2-magnitude tremor known as 'The Big One' can cause enough damage to divide the National Capital Region into four quadrants. 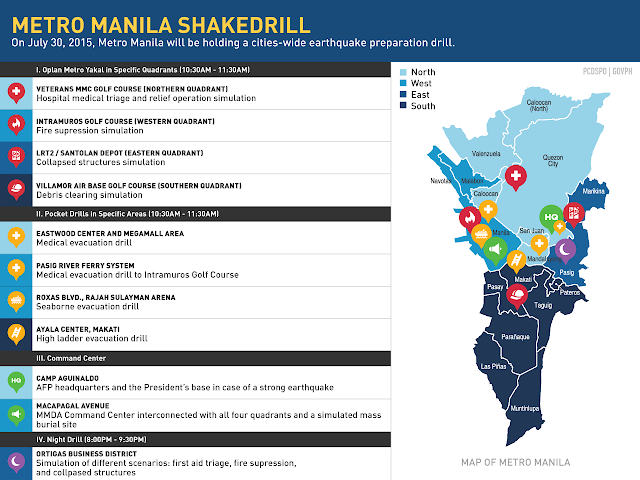 Because of this, the Metro Manila Development Authority (MMDA) conducts earthquake drills in each of the four quadrants to ensure a high level of readiness across the NCR, the country’s most populous region.